Hyundai Motor, South Korea’s No. 1 automotive company, has signed a memorandum of understanding with Chinese tech firm Baidu to boost cooperation on connectivity technology in a bid to ramp up demand from young Chinese drivers and its future mobility technology, the company said Tuesday. The signing follows shortly after Hyundai agreed to participate in Baidu’s self-driving project Apollo at the CES Asia 2018 in June. This time, the two agreed to “take their partnership to another level” by making joint efforts in four categories: connected car service; voice recognition; development of artificial intelligence robot; and internet of things. The two have been working together on a slew of projects since 2014, including their first connectivity service CarLife rolled out in 2015 and navigation Baidu MapAuto in 2017. “By cooperating with Baidu, which stands at the center of China’s IT technology, Hyundai will expand its position among Chinese customers, and improve its brand image as a forerunner in ICT innovation,” said Hyundai Motor. Hyundai said the AI robot will help drivers communicate with their car, as the robot would be able to express its feelings. 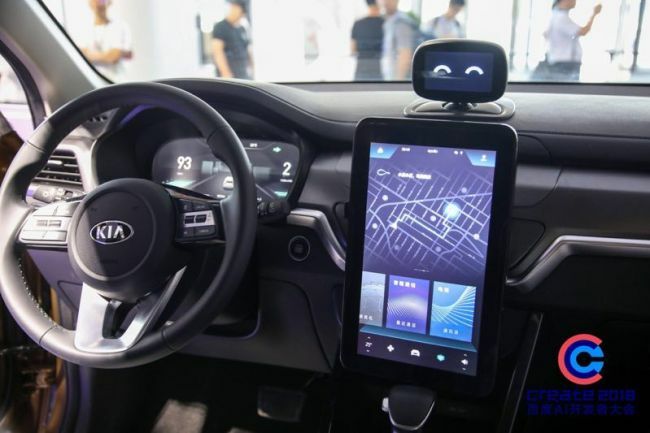 Playing the role of an assistant, Xiaodu will help with organizing tasks, such as reminding the driver of their schedule and booking movie tickets, while warning the driver when it senses the driver dozing off behind the wheel. Xiaodu, which is in the early stages of development, is featured in Kia Motors’ Sportage midsize sport utility vehicle which was unveiled for the first time last week in China. China’s internet of vehicle market has recently seen a rapid growth greatly due to drivers born between 1980 and 1990, also known as baling hou and jiuling hou, defined as consumers with high level education that embrace different cultures and highly prefer gadgets. According to data from market intelligence provider International Data Corporation, China’s connected vehicle and electric vehicle market size will grow from $4.87 billion in 2016 to $10.5 billion by 2021. Seeking a share of the lucrative industry, Hyundai has forged a number of deals with local companies and startups and introduced strategic models tailored exclusively for Chinese drivers. Its various attempts, however, has yet to bear fruit, with its first quarter earnings in China showing a 17 percent on-year drop, the company’s figures showed. “Second quarter operating profit is projected at about 960 billion won, down 5.4 percent than consensus. Despite the launch of Hyundai’s China-tailored vehicles, its sales isn’t doing as well as expected,” said Lee Sang-hyun, an analyst at IBK Investment & Securities. The anticipated 959.2 billion won operating profit between this April and June is a 28.7 percent drop from last year‘s second quarter.